October 20, 2018 10:53 am. Nick Bishara was comfortable with the reality of nursing a hangover all the way back to Auckland as he prepared to board a flight home from Melbourne on Sunday morning. The Ardmore Lodge-based trainer had celebrated long and hard alongside his fellow owners after their filly Verry Elleegant, who is now prepared by Darren Weir, scored a stunning victory in the Group 3 New Zealand Bloodstock Ethereal Stakes (2000m) at Caulfield on Saturday afternoon. “I’m a bit dusty this morning as it was a big night,” Bishara said. “It was just an amazing day and to win a race like that with a little old New Zealand filly doesn’t get any better. That dream began at the New Zealand Bloodstock Autumn Mixed Sale in 2007 when Bishara outlaid $5,000 for a Danroad yearling filly that he named Opulence. “I was attracted to her bloodlines as she comes from the family of Eight Carat,” he said. “I couldn’t believe I only had to pay five grand although that may have been the Danroad factor as he hadn’t done much as a sire then. “She had a lot of ability but we didn’t see the best of her through injury. Goodwin, a shareholder in the stallion Zed, had also been attracted by the Eight Carat factor in the mare’s pedigree and believed a mating would sit well with the son of Zabeel. “We first met Don when we bought Opulence’s first foal which was a Towkay filly that we named Black Lace,” Bishara said. Bishara was of the belief that the colt, named Verry Flash, would become his stable star until his little sister Verry Elleegant came along. “I really rate Verry Flash and think he has the potential to become a top stayer,” he said. Bishara organised several friends to race Verry Elleegant on lease with Goodwin and expected the filly would take some time to reach her potential. “The Aussies are saying she is a lightly framed filly but to me she is just a typical kiwi staying type,” he said. “When we first got her I thought she would take a bit of time to mature so we planned to give her one start as a late two-year-old and then turn her out and let her develop. A flashing run for second in a maiden two-year-old event at Te Rapa in July convinced Bishara his opinion of the filly was justified but also that she might be capable of continuing her preparation without an immediate break. It also set the phones ringing as bloodstock agents spotted the filly’s potential as well. “When she ran second we thought we’d give her another run as she came through that first one well,” he said. “There were quite a few phone calls but as she had a very high right of purchase they didn’t come to much. Verry Elleegant had come from last to loop the field and effortlessly break her maiden over 1400m at Ruakaka, the type of performance that is seldom seen at the venue. With the offers coming thick and fast, Bishara, Goodwin and their fellow owners were faced with the task of deciding on what to do with the potential star. “It all got a bit frustrating to be honest as there were plenty who were mucking us around,” Bishara said. “In the end she ran and won at Matamata and then we got serious on what to do. The offer that we accepted meant we could retain twenty-five percent ownership of her and transfer her to Darren and that led us to where we have got to today. “We met most of the new owners at Caulfield yesterday and they are a great bunch. We celebrated long and hard but I did have time to reflect a little on it all and it is just an amazing feeling. 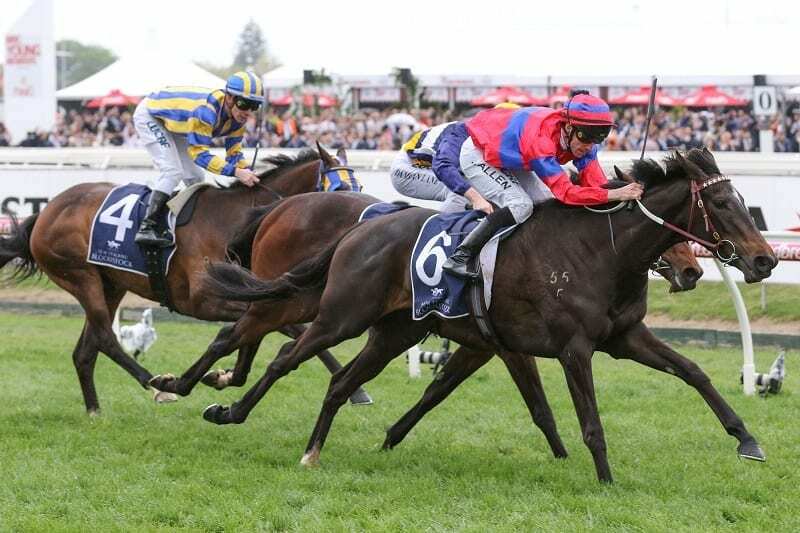 Saturday’s victory saw bookmakers install Verry Elleegant as the $2.50 favourite for the Group 1 Kennedy Oaks (2500m) at Flemington on November 8 with Bishara promising to top Saturday’s celebrations if she can find the winners enclosure again.